Sam Bennett has taken the opening stage of the Tour of Turkey and now leads the race. 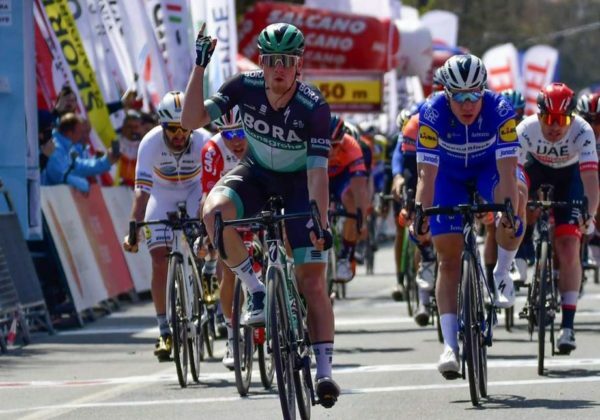 Sam Bennett has stormed in to claim the opening stage of the 2019 Tour of Turkey, bringing to eight the number of victories he has taken in the race over the past three seasons. The event has usually been on at the end of the season but has been brought forward this year, with Bennett today picking up where he left off last year; on top of the podium. After 156.7km from Istanbul to Tekirdağ he came in at the head of the bunch sprint to win from Fabio Jakobsen (Deceuninck-QuickStep), who sprinted for the wrong line, and Caleb Ewan (Lotto-Soudal). Bennett has enjoyed a great season to date, opening his account with a final stage win at the Vuelta a San Juan in Argentina. He then went to claim the final stage of UAE Tour and took two prestigious victories in Paris-Nice; all adding up to his best season start ever. And now in Turkey he has taken another and will have plenty of time to add to his tally even further in coming days. Today Deceuninck-QuickStep massed on the front of the bunch, hoping to lead their 22-year-old Dutch sprint Jacobsen to victory. The Belgian team and Bennett’s Bora-hansgrohe squad had earlier in the day done much of the work to bring back the early breakaway. And while Jacobsen looked in a great position to win, he was scuppered by Bennett’s superior speed and by lunging for a line just before the finish line. However, even without that slight mishap at the finish, Sam Bennett looked like he had things under control and won it well in the end.